This Vibrant long coat featuring lapel collar, front button closure with the adjustable belt on waist, two pockets on front and full sleeves. This coat is perfect pick as winter apparel to keep you warm as it has the leather hoodie on the back as well. You can wear this costume at the costume party as well. 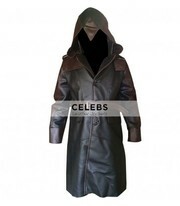 Visit here Celebs leather Jackets. Car boot sale ad details Assassin's Creed Unity Arno Dorian Costume Trench Coat for sale in London. Assassin's Creed Unity Arno Dorian Costume Trench Coat available on car boot sale in London. More Coats & parkas for sale in London and more second hand sale ads for free on 2lazy2boot - London car boot fairs - 41651.